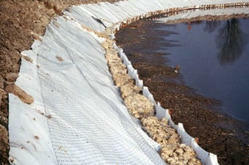 We offer a wide range of Non Woven Geotextile Fabric. These properties are often combined to create fabrics suited for specific jobs, while achieve a good balance between product use-life and cost. The appearance, texture and strength of it is like a woven fabric and it can be as bulky. The reinforcement function is basically to improve deterioration characteristics of the structure. This is punched with help of needle for formation of strong fabric which is able to retain its dimensions which enhances its life span and makes it perfect for use. Looking for Non Woven Geotextile Fabric ?